Over the past few years, internet purchases have dramatically increased. Current statistics show that purchases made online have doubled between 2014 and 2015. The convenience of online shopping has made it the preferred medium for many shoppers with products and services at their fingertips via their smartphones or tablets. For example, consumer’s cart of online purchases on a mobile device has risen signi cantly during this time. In 2015, an average of 500€ of online purchases has been made via mobile by Europeans and $670 for US consumers. The eCommerce boom doesn’t seem to feel the effects of “economic crisis” as it continues to rise. Projections for the coming years show an even greater increase in these figures as a greater number of consumers convert to online shopping mediums. From a sales perspective, choosing the right eCommerce software for your business is vitally important. An eCommerce solution cannot be limited to just a “Buy” button on your website; many features should be taken into account when comparing solutions. Behind any eCommerce page there is a real business to manage where you’ll need other solutions like inventory management, accounting software, marketing tools, etc. On the front end, you’ll need an interface that provides great usability that will encourage repeat customers and improve your sales. Lastly, an eCommerce solution should also showcase your products, using a beautiful and functional design to win over customers. PrestaShop was founded by French students in 2007. Ten years later, the open source software can be proud of providing more than 250,000 online store owners with a simple, complete, and internationally adaptable software. The company has locations in Paris and Miami and hosts more than 850,000 members in its open source community. PrestaShop is available to download for free. The latest stable edition 1.6.1.3 was released in July 2015. The upcoming edition 1.7.0 is scheduled for a stable release in Summer 2016. For this comparison, we chose to compare the 1.6.1.3 edition. With software applications in many different industries, one of the most commonly underdeveloped components is the user interface (UI). Many choose to invest less time and resources into designing an optimally functional UI as it is considered a second priority to core functions and back-end developments. This lack of balance typically translates into a poor user experience and minimal impact on productivity. When it comes to efficiency and end-user satisfaction, fine-tuned usability is one of the most important factors in any software. Indeed, a solution must take into account the needs and goals of a user in order to actively help them achieve their objectives. The user interface supports the overall product design in deciphering human factors such as preferences, habits, and learned skills in order for the software to effectively serve its intended purpose. A strongly functional design is critical in providing a positive user experience. Usability is measured as a software’s ability to anticipate what a user might need to do. This includes ensuring that all of the elements in the interface are easy to access, understand, and use. Well designed software will provide usability that helps the users feel comfortable with the system as well as with obtaining their desired result. It will help users perform actions quickly and become more efficient. Best practices also advise having a simple interface with consistency (common elements) and a page layout based on hierarchical importance and flow. Let’s have a look at screenshots of the back-end of these four products to compare the layouts of each interface. Odoo is not an eCommerce dedicated software. 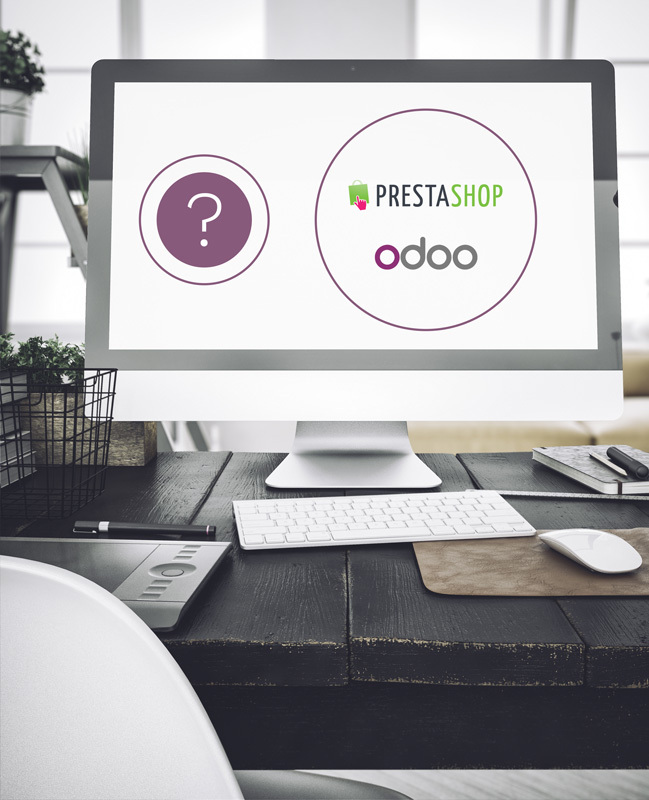 It’s a suite of business applications where the eCommerce app is integrated with the other ones Odoo offers. The search volume on this graph might include non-eCommerce searches. All the articles about eCommerce give the sames trends: mobile/tablet-friendly, flat design, large images, fast and simple. Moreover, there’s a feature that will continuously be improved: the usability for visitors. Software usability has to keep the “codes” in order to satisfy the user and help them become more productive. This applies for the merchant too, keeping the “codes” satis es the buyer and increase their sales. With this comparison, we can see how difficult it is for eCommerce software to have both features and usability. On one hand, Magento and PrestaShop have a lot of features, but their usability has to be improved. On the opposite, Shopify doesn’t have native features, but shows real progress in usability. In the middle, we find Odoo with many unique features and a very good and satisfying usability interface. 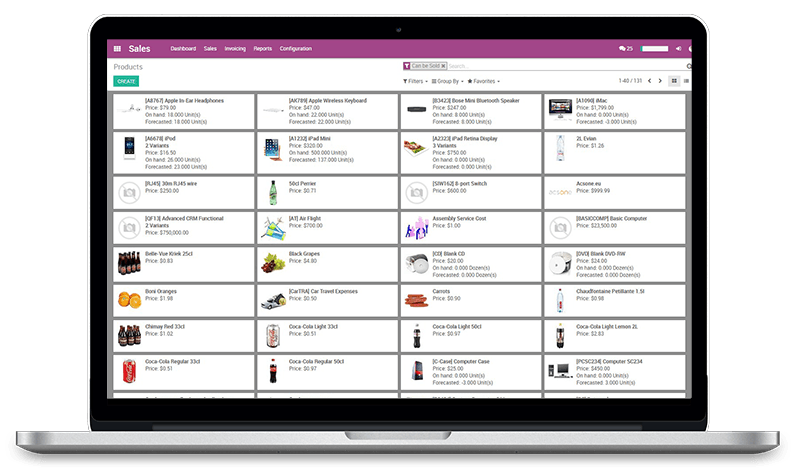 Previously dedicated to ERP, Odoo is far from being mature in its eCommerce app, but it offers many possibilities. 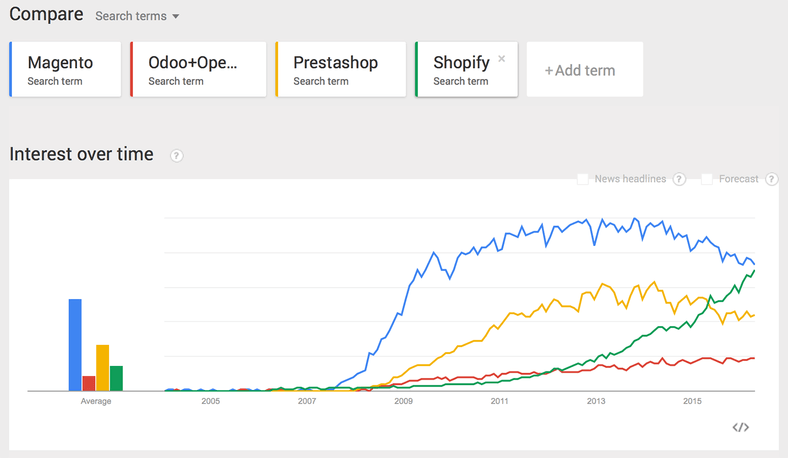 Odoo eCommerce developments are in their infancy. The app is very promising, without forgetting the integration with the other apps of the business solution. 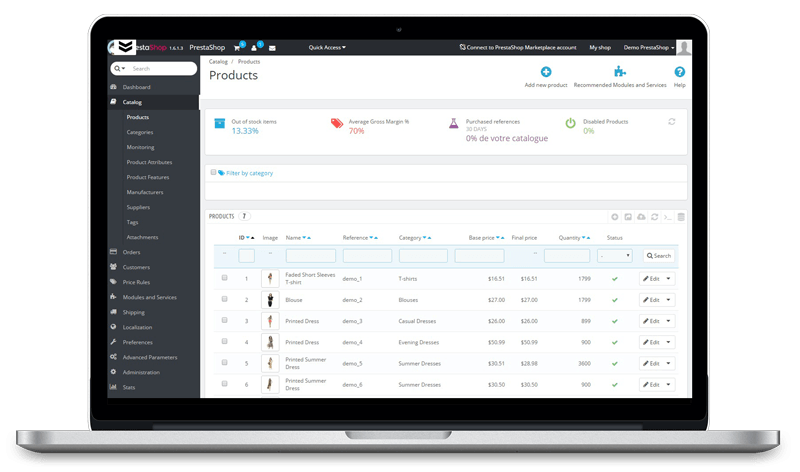 When choosing your eCommerce software, don’t forget to picture your business in the upcoming years. This will help you to make the right choices today and have control over your growth. Think about an eCommerce software that can be easily integrated with other business solutions. An easy integration means that it has to be simple and fast while also incurring minimal implementation costs. The ideal solution would be to integrate with your eCommerce software other solutions which look alike. You will be at ease with the back-end interface without losing any productivity. This is how business application suites come in handy.